cryptomator stores salt/ parameters in a config file, but as I want to encrypt and decrypt single files, they have to be stored with the file. It should as safe as the boxcryptor encryption when I store the salts for the key derivation (for MAC & content) in the ciphertext, is it? Another question is: Do I really need two salts & keys? According to this thread there's no known interaction between SHA-256 and AES, but on the other hand, it seems just sloppy to me to use one key for both and also there are possible unknown interactions. I'm really interested in what you think about that. It should as safe as the boxcryptor encryption when I store the salts for the key derivation (for MAC & content) in the ciphertext, is it? Yes, that's the definition of a salt, a salt is public (otherwise it is commonly called a pepper). E.g. the various text encodings of bcrypt store the salt next to the hash (which has the same security consequences as storing it next to the ciphertext). Do I really need two salts & keys? And using two salts implies deriving the key multiple times. That's bad, especially if that is done by using a password derivation twice. This looks like the case for your scheme. Performing PBKDF2 twice or for more output than the hash delivers will double the amount of work you have to do while an attacker has to perform the 50K operations only once (per try). Using HKDF or any other KDF over the output of PBKDF2 is sufficient and much more efficient. You can just use two different labels (identifiers) for the two keys - if two keys are needed. This is also present in the answer of Codes that you linked to. Another trick is to extract 256 bits of output from PBKDF2 and then split that into two 128 bit keys (or two 256 bit keys for PBKDF2 with HMAC/SHA-512). You probably don't need to extract an IV if the salt is always different (because the derived keys would then also always be different). Or you can generate a separate IV: your choice. No, you don't need two keys either. You could use a mode of authenticated encryption such as AES-GCM. Then you'd only need just one key. 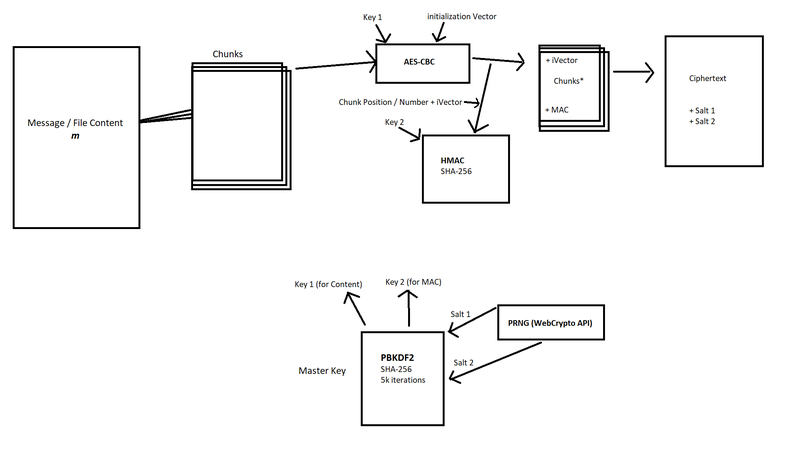 If you use HMAC with a single key then you probably cannot prove that it is secure. But the chance that you run into practical security issues is minimal. Don't change the MAC to CBC-MAC or another MAC based on AES if you use a single key, because that could make your scheme vulnerable to attack. The protocol using a single key and separate cipher and MAC is more brittle: it could break catastrophically if you implement it incorrectly. Not the answer you're looking for? Browse other questions tagged aes protocol-design pbkdf-2 salt or ask your own question. Should I salt an AES password at each encryption? Injecting salt into PyCrypto KDF - useful? Storing salts and iteration number? Is there a tangible benefit in keeping the number of PBKDF iterations secret and not storing them with the ciphertext? How do I create an effective salt?